Donald Gowan takes a comprehensive look at forgiveness in the Bible. In looking at both the Old and New Testaments, here he divides each into two sections: ‘God Forgives Us’ and ‘We Forgive One Another’. In both cases, ‘the God Forgives Us section’ is longer. It is this aspect, ‘God Forgives Us’, that is the focus of this review. In particular two theological themes emerge from Gowan’s book. The first is God’s forgiveness being grounded in his character. And the second is the complicated relationship between repentance and forgiveness. The second theological theme that runs through Gowan’s book is the complicated relationship between repentance and forgiveness. 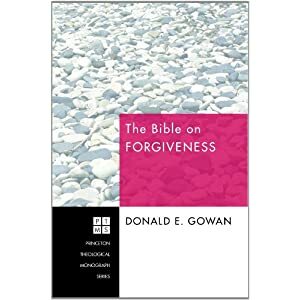 As Gowan traces the passages that speak of forgiveness, it becomes clear that the Bible does not always demonstrate that repentance must precede forgiveness. Indeed, as Gowan demonstrates, more often than not, God forgives, which in turn allows the person (or nation) to repent and turn to him. This starts, according to Gowan, in the narrative of Exodus 34. God forgave the unrepentant Israel so as to insure the continuation of the relationship. And while it is true that the Deuteronomistic History of Joshua-Kings, as well as the sacrificial system, demonstrate a theology of repentance preceding forgiveness, the prophets demonstrate that God forgives, and promises to forgive, without Israel first repenting. Repentance appears to be dependent on God’s work. God revokes the punishment, prior to repentance, and because of God’s action of forgiveness Israel is able to repent. Even in the New Testament, while the model in Acts is “repent and be baptized”, this repentance and the possibility of forgiveness comes in light of Jesus’ death and resurrection. To state it another way, because Jesus forgave, we can now respond by repenting in light of the proffered forgiveness. Indeed, when a person’s sins are forgiven, they receive the indwelling of the Holy Spiri,t which brings about the change that the Old Testament authors had hoped for. Gowan argues that this becomes the impetus for the activity of the apostles and early Christians in the book of Acts. They were able to go out and proclaim the Good News precisely because Christ had forgiven them. The parables, like the Prodigal Son, demonstrate the model of forgiveness preceding repentance. Even in the epistles, like 1John, the message is that we can confess our sin because God is forgiving and has forgiven us through the work of Jesus’ death and resurrection. Interestingly, Gowan notes that Paul rarely speaks of forgiveness, choosing instead to speak of justification, and that on the one or two occasions that he refers to repentance (in the Corinthian church) he does not also speak of forgiveness. Gowan argues that forgiveness in the Old Testament is not only a forgiving of past wrong, forgiveness also encompasses the idea of healing, cleansing and change. From a theological perspective, what this demonstrates is that, in the Old Testament, forgiveness is not just justification, it is also sanctification. When God forgives, it involves the changing and healing of the offending person with the goal of restoring the broken relationship. To just have sins forgiven does not mean that there is a restoration of relationship, there needs to be change. This is also the message of the New Testament, with the only change being that this forgiveness, which brings healing and restores and sanctifies the relationship, is now offered specifically in the name of Jesus, and is no longer just for Israel, but is available for all peoples of all nations. That forgiveness is a part of the very character of God, and that this is repeated throughout the Old Testament, may suggest a way through the two God (God of the Old Testament vs. God of the New Testament) dichotomy to which many Christians hold. It would be an intriguing project to develop a theology of God that finds its focus on the forgiving nature of God, rather than on the holiness or love of God. A possible weakness may be found in one of the conclusions Gowan draws about forgiveness. He writes that, “forgiveness may begin entirely by the initiative of the injured party, but it can never achieve what is intended unless it can be accepted by the guilty one.” The question arises, is Gowan’s understanding of forgiveness then not dependant on repentance so much as it is on acceptance of said forgiveness? Gowan demonstrates how forgiveness precedes repentance more often than repentance precedes forgiveness, and so the question becomes, what is the role of repentance? Could the downplaying of repentance be an example of God’s reformed theology that emphasizes the monergistic work of God? While a theology of repentance is outside the scope of this particular work, it is important to remember that repentance and forgiveness, in whatever order they appear, are still theologically related. Gowan’s book is an important contribution to the Church’s development of a theology of forgiveness and reconciliation. By tracing all of the passages concerning forgiveness, and how they are all connected back to the very character of God, this book offers a much-needed corrective to today’s pop-psychology-saturated church. It is important to understand the broader biblical picture of forgiveness, as it will help the Church to translate, interpret and apply those popular passages on forgiveness that we too often read through the lens of our contemporary culture’s definition of forgiveness.